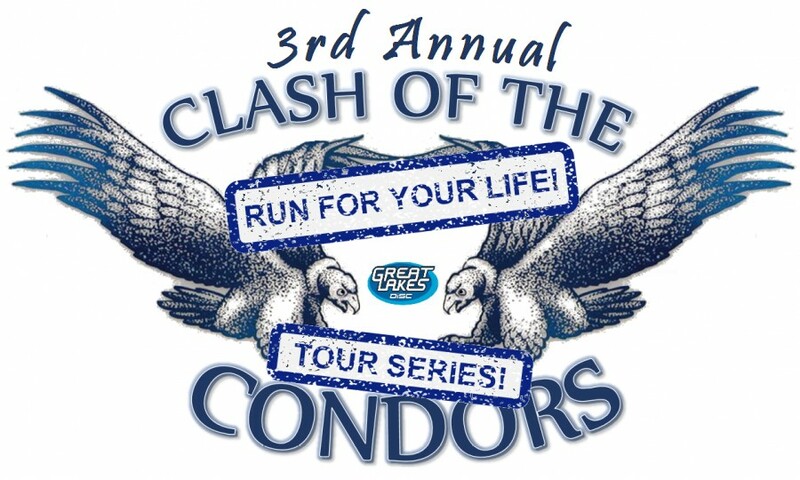 Home › Tournaments › Michigan › Clash of the Condors RUN FOR YOUR LIFE! 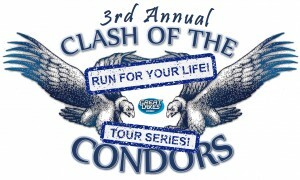 Clash of the Condors RUN FOR YOUR LIFE! CLASH OF THE CONDORS, RUN FOR YOUR LIFE! TOUR SERIES!!! Fly the majestic Condor in this 1 round, 25 hole, CONDOR/PUTTER ONLY TOUR SERIES kickoff event. Great Lakes Disc is sponsoring this event... this means go buy awesome stuff there because they are super generous people and we want to see them thrive in West Michigan! 1. Only a Condor and a putter can be in your bag. 2. The Condor must be thrown off the teepad. 3. One additional disc of your choice needs to be thrown on holes 18-20 (CTP3). 4. Tournament limited to 777 people (Invite your friends, lots of them). Sign up at Great Lakes Disc OR day of tournament. Please let us know in the discussion area if you plan on coming. 5. Entry fee - 99¢. Yeah, that's right. EXACT CHANGE ONLY. NO EXCEPTIONS! 6. On your teeshot, if you hit the basket (not pole), each person on the card must pay you an additional 99¢. 1. Current Condor/putter round record at Three Acres is -12. 2. Doug's funky house rules apply (OBs, CTP 3, and Taco Putt). 3. Tee time is 4:05 PM. 4. No illegal substances on Doug's property. 5. Cookey & jankey prizes galore! 6. 100% of entry fee's go to the winner. 3rd Place - Kyle Eno, Had to break a tie to get mentioned here. Players pack includes at least $1 worth of valuables. Please park across the street on Jamie Ln.